You know, talent management isn’t all fun and games. Or is it? Making a game of management and HR tasks was the topic du jour there for some time and many companies –vendors and organizations alike– are still trying to figure out how to use rewards and gratification to attract and retain employees, improve employee performance, and increase engagement. According to analyst Jason Averbook, the theory is that by applying the same principles that inspire people to play games – achievements, status, and rewards – to employee performance, businesses can drive deeper engagement, and increase alignment with corporate goals. Game thinking is part of the mainstream whether folks are conscious of it or not. For the last 40 years, consumer expectations have been fundamentally altered by exposure to games. Specifically, this means our beliefs about the meaning and value of fun, frequency and context of rewards and omnipresence of sociability. The simple shorthand is feedback, friends and fun – what I call the three Fs. As a result of these changes in expectation (and brain chemistry, natch) we increasingly demand a different, faster paced world. The consumer has changed, and smart businesses must adapt to survive…and thrive. And the HR Tech space is no different. More than so-called “Mickey Mouse manipulation” HR leaders are exploring the reasons behind gamification. And using the knowledge to tap into new sources of talent. Companies like Marriott, IBM and Deloitte are all using gamification to increase workforce alignment, improve employee skills, solve difficult issues and tap into to new talent pools. 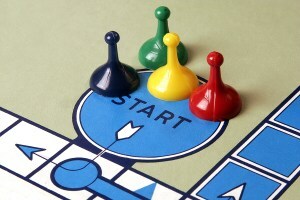 In fact, while the HR blogosphere has moved on to other topics, gamification has slowly been adopting adherents among the corporate set, with new Gartner research estimating that by 2014, some 70% of large companies will use the techniques for at least one business process. And vendors are paying attention. Market researcher M2 Research estimates revenue from gamification software, consulting and marketing will reach $938 million by 2014 from less than $100 million this year. That’s a lot of badges. Companies like Rypple, Salesforce, PeopleFluent and Sharepoint are all helping organizations get closer to their gamification goals with applications, embedded social technologies and entire divisions focused around bringing the “big five“: (badges, points, leaderboards, challenges and levels) into long-standing HR practices like performance reviews, user engagement, workplace wellness and even collaboration. Now companies are taking the next step: conducting studies on increased engagement like IBM and using gamification mechanisms for specific business objectives like Cisco, and studying variable reward theory like Saffron Interactive. A common thread among analysts, organizations and prominent vendors is that “gamification” goes way beyond e-learning, which is the most obvious and natural fit for the technology. Gamification can and is being used for internal and external education at the enterprise level, but it’s also being used at a much broader level: in essence, to make work fun.